This week: changing bulbs a hundred feet up at Heathrow, a futuristic library of LED books, and new resources from EnergyStar. The US Department of Energy's EnergyStar program (administered by the Environmental Protection Agency) has developed new educational resources under the slogan "Just look for the ENERGY STAR." Here comes more direct competition for the Philips Hue. (See the Related Posts below for more.) A company called Lumen is selling LED light bulbs whose output can be modified via a smartphone app using Bluetooth 4.0, instead of the ZigBee mesh by which Hue is controlled. The company behind it, Tabü, seems to have found funding for testing and production, even though an Indiegogo campaign a year ago fell far short of attracting enough backers. The bulbs do much of what Hue does: change color and brightness, fade in and out in a sunrise/sunset simulation, turn on or off with proximity, etc. The control is all local (the company claims a range of 30 feet, or 9.1 meters, with Bluetooth 4.0). There is no control over the Internet or programmability with IFTTT. The 450-lumen bulbs cost $70 each. Being Bluetooth-based, they do not require a WiFi/ZigBee gateway, as Hue does, but three Lumen bulbs will set you back $10 more than Hue with its gateway. Unlike Hue, Lumen has not opened an API for software developers to build on. Here's a review on CNet. 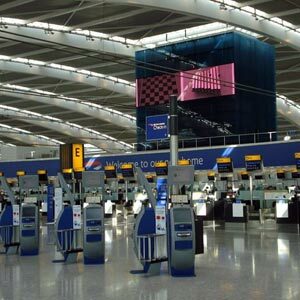 Terminal 5 at Heathrow Airport in the UK is 1,300 feet (396 m) long, 515 feet (156 m) wide, and 128 feet (39 m) high at its highest point. The ceiling is dotted with 120,000 lamps, 60 percent of which have now failed. Those in charge of maintenance have been unable to change them out. They recently called in skilled teams of men with ropes -- abseilers. Apparently, Heathrow first considered suspended platforms, tall cherry pickers, and other potential solutions, but they were all found unsuitable on safety grounds. The replacement lights will be LEDs. The South Korean artist Airan Kang spent a year traveling the world and visiting famous libraries in order to recreate them in the form of a digital library of 109 books (the ones that have inspired her) made from LED lights and custom electronics. She has been at the project for at least four years, and she has mounted exhibitions at galleries in Korea and New York.